Meredith, New Hampshire is a small town at the northwest end of the largest lake in New Hampshire. We got to Bar Harbor about a week before peak season for the autumn colors. We hit New Hampshire about 3 days past the peak. It was a cloudy day and the autumnal colors were muted but still pretty awesome. The nor’easter storm that hit us in Maine also swept through to the White Mountains and sent a cold blast across the lake. Winter was coming, but not for a couple of weeks. 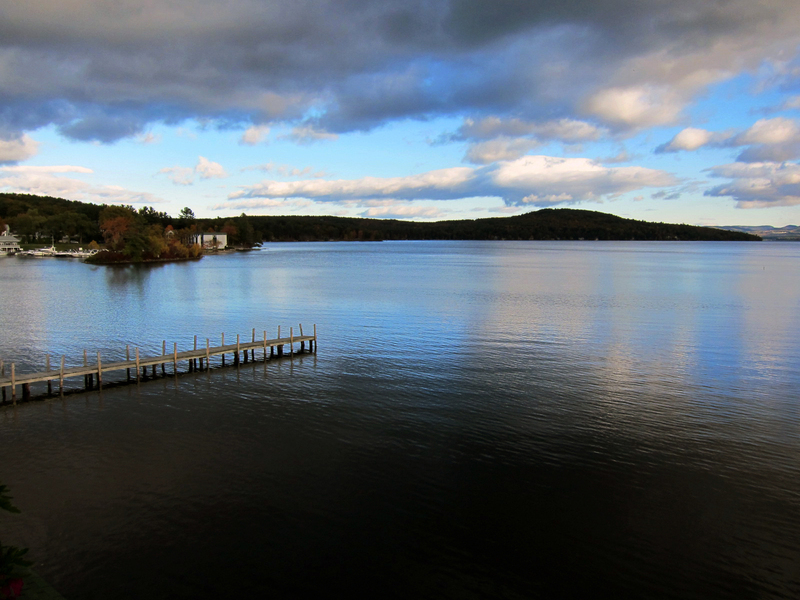 The Abenaki Indians named lake, Winnepesaukee, or “the smile of the great spirit”. It’s 21 miles long and 9 miles wide at the widest point. I’m sure from one of the nearby mountain peaks, it can, sort of, resemble a smile. Meredith isn’t really a place of any great interest. Meredith Village has a population of less than 2,000 people but like Bar Harbor, it probably increases 10 fold in the summertime. There are countless cabin parks, referred to as Condominiums, all around the lake. We’re happy to be in a quiet village. 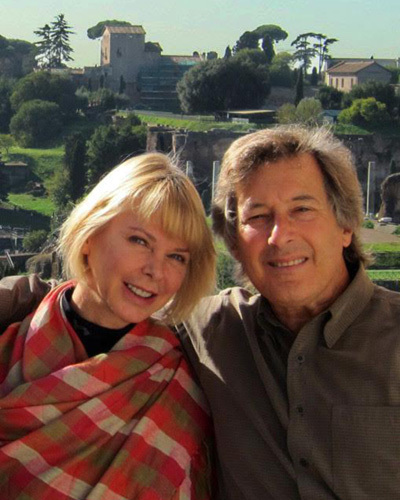 We have a great hotel room with a fabulous view overlooking the lake and a couple of nice restaurants nearby. The hotel, The Inns at Mills Falls, has 3 hotels in Meredith. 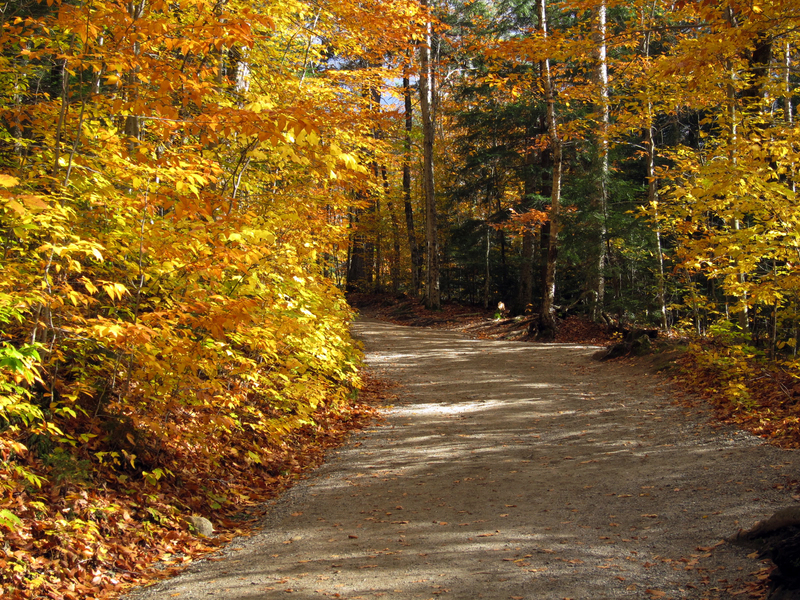 From Meredith, it’s a 90 minute drive down the rural roads, through the canopy of autumn leaves to the base camp of Mt Washington, part of the Presidential Mountain Range in the Franconia Notch National Park. The notch refers to the mountain pass through the White Mountains. 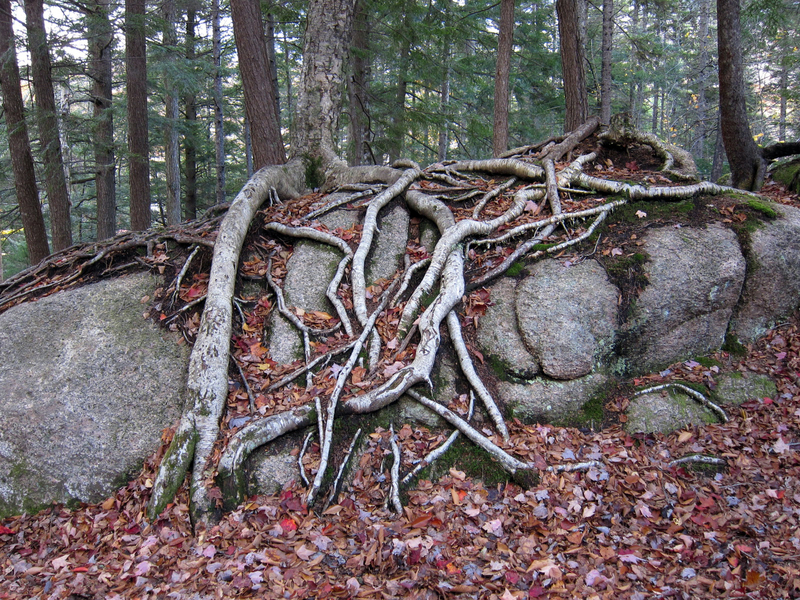 Franconia Notch was once famous for the 40′ tall, 25′ wide rock formation known as the “Old Man of the Mountain”. It was THE most famous image of New Hampshire. It’s been on the State Emblem since 1945. It’s image has graced license plates, postage stamps, state and rural road signs and in 2000, it was issued on a commemorative US quarter. Then, on May 3rd, 2003, the old man grew too weary and fell off the mountain. We saw a couple a places taking donations to build a “Man in the Mountain” memorial”. I don’t know why they just don’t get up there and carve another one. Base Camp, Mt Washington is at 2500’. The summit is at 6288’ and the best way to the top from base camp is by the old Cog Railway. The train has been taking passengers up since 1866. This was the first steam powered cog engine in the world and 144 years later, it’s still making it’s daily trips up the mountain. There is still one steam-powered engine that takes the ride every morning, but the others have been updated to diesel fuel. 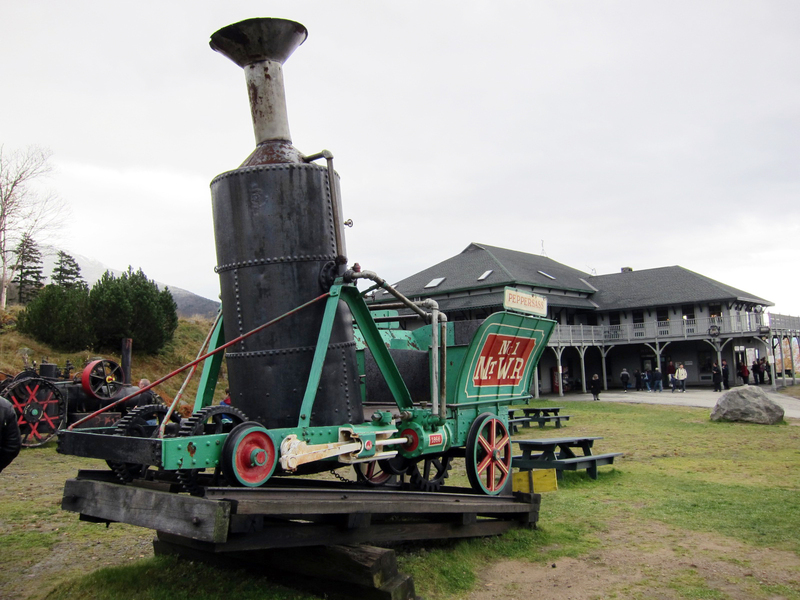 The original steam engine, “Peppersass”, built by Sylvester Marsh in 1866 is still on display at the base camp. It looks like it could still make the trip. 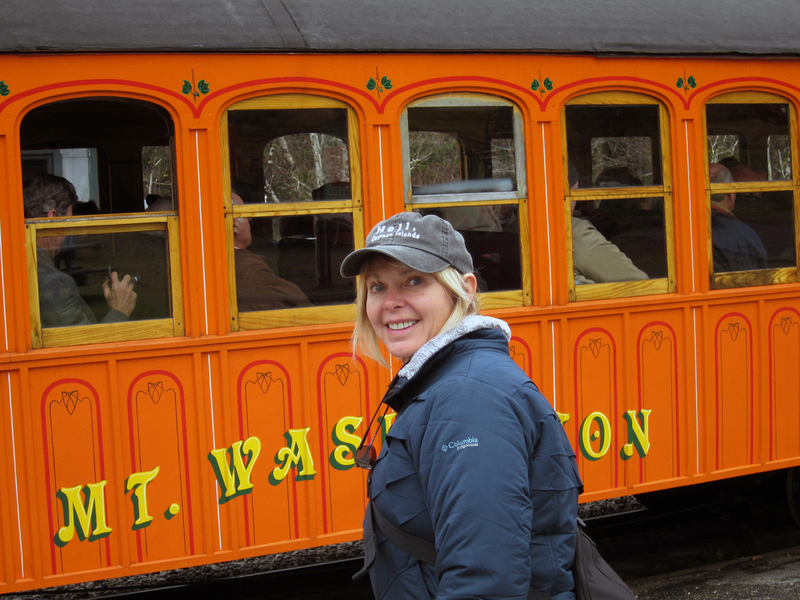 The cog railway is safe but there have been accidents. In 1967, 8 passengers were killed and 72 injured when the train derailed and fell off the mountain. Since then, the tracks have been reconfigured and so far no other tragedies have been recorded. At 2.8 miles per hour up the steep incline, it takes about an hour to reach the summit. It’s about 45 minutes to come back down. It windy up there. The top of Mt Washington is one of the windiest places on the planet with gusts up to 231mph. The record of 234 mph was recorded in 1934. The Abenaki Indians called the peak “Agiocochook”, or home of the Great Spirit. You would think they’d have a name for the wind. They probably did. At any rate, be warned. Dress warm. 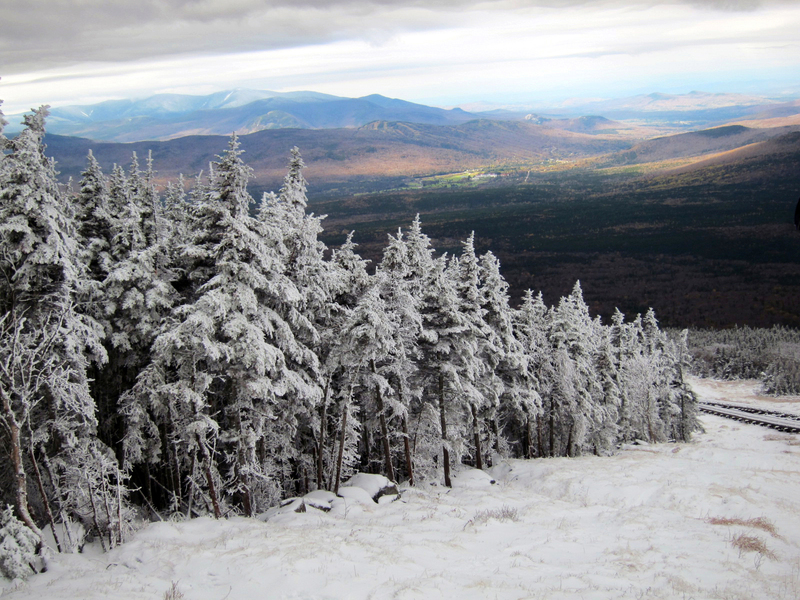 The nor’easter storm in Maine also brought the first snowfall of the year to Mt Washington and due to the weather and the snow, the cog railway could only make it half way up the mountain. We didn’t get the complete package but we did get to see something really spectacular. The railway car held maybe 80 people and all of them were up and down the car snapping off as many photos as possible in the short time up there. The heavy snowfall hugged the tree limbs of the mountain conifers like soft blankets. In the early 1900’s, a group of daredevils fashioned boards to fit over the tracks and would slide down the mountain. The boards were referred to as “Devil’s Shingles”. The fastest one reached a speed of 62 miles per hour, but after a few deaths, in 1906 the boards were outlawed. There are still a few of them in the Base Camp museum. Back at base camp, we returned to the car and drove south for about 45 minutes to the Flume Gorge, another of the magical places in Franconia Notch. Although the falls are prehistoric, the site was only discovered in 1808 by 93 year old “Aunt Jess Guernsey” during one of her fishing trips. The granite stone walls of the gorge rise up close to 100’ and are spread about 15’ apart. It’s a very otherworld experience. The park trail is an exhilerating and relaxing 2.3 mile hike through waterfalls, lookout points, glacial rocks, covered bridges, beautiful foliage and of course, the flume gorge. For those who can’t make the walk, the park has set up a shuttle that departs from the Visitor’s Center and arrives very close to the falls. One of the more interesting sights along the trail are the yellow birch trees growing out of the granite rocks. Somehow the seeds sprouted on the rocks and were so determined to live they sent roots along the rock into the ground, occasionally traveling over 3 feet to get into the soil. For anyone into tree or plant roots, this is the place to go. It’s very alien sci-fi and one of the marvels of nature. 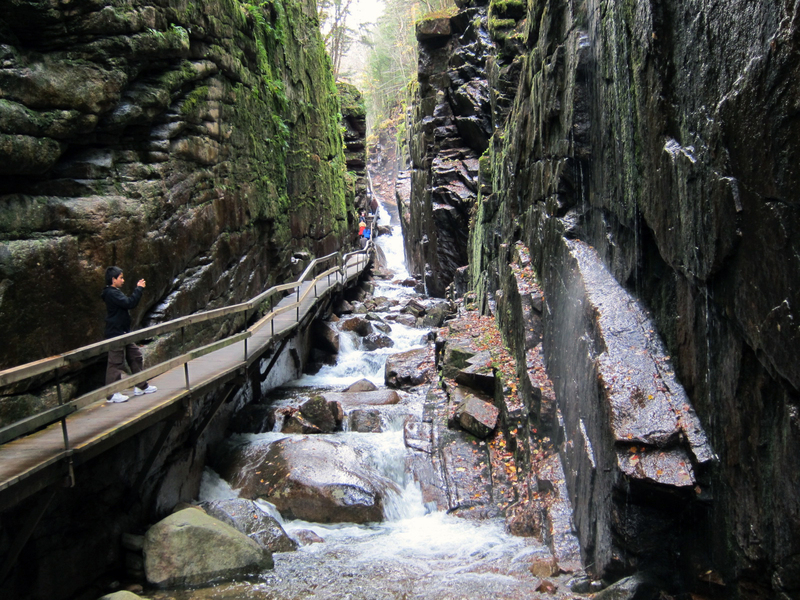 Just remember, the Flume Gorge Park opens May 9th and closes October 26th. Another advantage to staying in Meredith was we got to drive along the famous Kancamangus Highway from Flume Gorge back to the lake hotel. 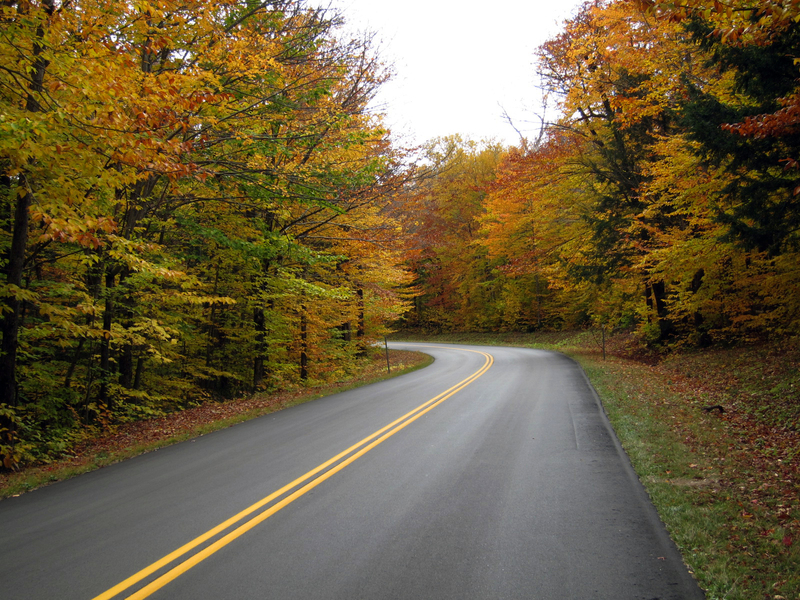 The road is renown for the best foliage viewing in New Hampshire. It also runs nearby some of the many covered wooden bridges.. The are currently 54 of these bridges still in existence, dating back to 1820. The Blair Bridge crossing the Pemigewasset River is a real engineering accomplishment. Built in 1870, the bridge is 293’ long with two clear spans. The first bridge here was built in 1829 for a cost of $1,000, but it was burnt down by a maladjusted religious arsonist named Lem Parker who claimed that “God told him to do it.” Even though Parker confessed to the crime, since there were no witnesses, he was found “not guilty”. That’s New Hampshire justice. 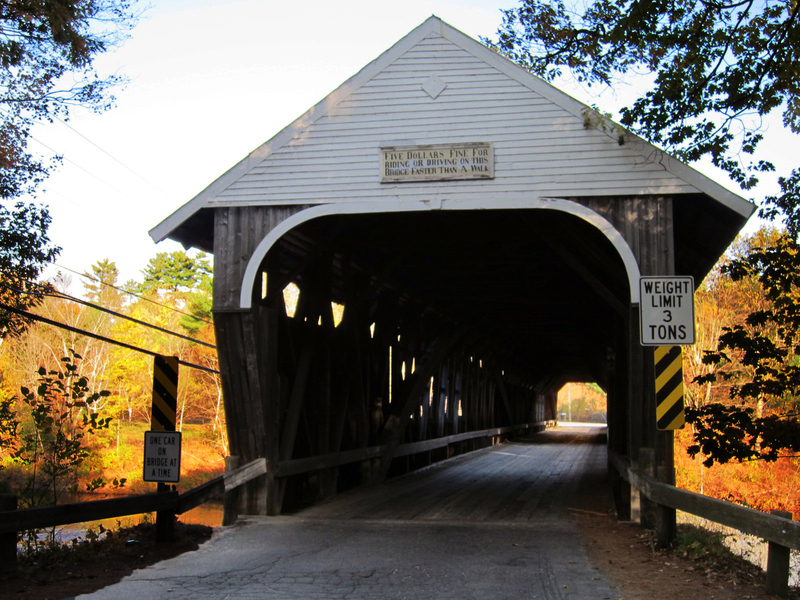 The bridge was rebuilt after a local Doctor tried to ford the Pemigewasset River on horseback in a strong current. The horse drowned but the Doctor survived and consequently made a plea to the town to rebuilt the bridge. In order to preserve the integrity of the structure, the Town legislators posted a fine for riding or driving a carriage faster than a normal walk. The sign still sits over the bridge, although it’s probably not the original sign.